be different and fashionable every day. Monitor your daily workout activities including steps, distance, calories and activity time. The fitness tracker automatically monitors your sleep time and sleep quality at night, by reading all these sleep data you can get to know your health condition. Sync the fitness band with our smartphone App, you can set alarms, sedentary alert and incoming call notification. Wesoo K1 fitness tracker, your important private health assistant. IPX7 level waterproof enables you wear the watch in washing and rain. But not for diving and swimming. More available band features in our App, the App is compatible with iPhone, Samsung, LG, and all other Android phones that support Bluetooth 4.0. 【Important Note】 Wesoo K1 does NOT INCLUDE HEART MONITOR feature. Track your workouts, steps, distance, calories. As well as your sleep quality metrics. Your health assistant now is on your wrist. 【Multifunctional Fitness Tracker】 Wesoo K1 fitness tracker supports date & time auto sync, sedentary alert, alarm, incoming call notification. Explore more band features in our App using any iPhone or Android phone. Replaceable wristband makes your everyday workout stylish and colorful. 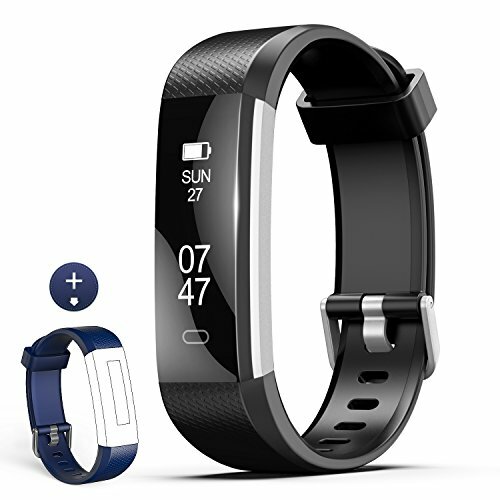 【Enhanced Accuracy】 All-new hardware architecture enables faster processing and more accurate workout data, ineffective data filtration makes K1 activity tracker even smarter than ever. 【Charge Anywhere & Anytime】Built-in USB makes it easy to charge K1 Fitness watch, simply connect to any universal power adapter, PC or power bank without requiring particular adapter. 【Warranty & Support】 Wesoo's 7*24 online support standing by, RISK FREE 100% money-back guarantee, 12-month Replacement Warranty and life-time technical support. If you have any questions about this product by wesoo, contact us by completing and submitting the form below. If you are looking for a specif part number, please include it with your message.